A new model, called “Human Dynamics”, has been proposed that individuals execute activities based on a perceived priority of tasks, which can be characterized by a power-law distribution of waiting time between consecutive tasks (Barabάsi, 2005). This power-law distribution has been found to exist in diverse human behaviors, such as mail correspondence, e-mail communication, webpage browsing, video-on-demand, and mobile phone calling. However, the pattern has been observed at the global (i.e., aggregated) level without considering individual differences. To guard against ecological fallacy and, more importantly, to uncover underlying mechanism, it is necessary to test the model at the individual level. The current study aims to address the following research questions: Is the power-law uniform across individuals? What distribution do individual behaviors follow? We examine the questions with a client log file of web browsing behaviors by nearly 4,000 Internet users and a server log file of file sharing behaviors by 2.3 × 106 users in a P2P system. The results confirm the human dynamic model at the aggregate-level in both data. 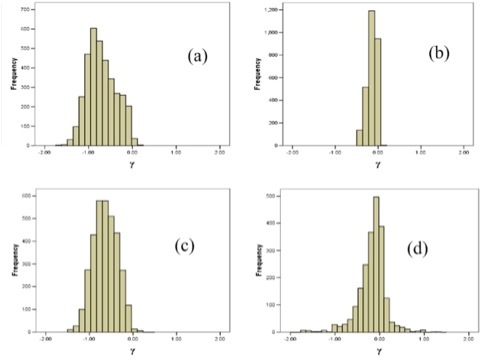 We have also found that there is broad variability across the individuals in the decaying rate (i.e., the exponent γ) of the power-law distribution, which follows well-known distributions (i.e., Gaussian, Weibull, and log-normal). Source: Zhu, J. J. H., & Peng, T. Q. (2009) Global Regularity and Individual Variability in Dynamic Behaviors of Human Communication. Presented at the Research Seminar of Department of Media and Communication, City University of Hong Kong.